Our thoughts on the latest news from Babbittsonline, Arctic Cat, Honda, Kawasaki, KTM, Polaris, Suzuki, and Yamaha! Our doors are open, and the big deals are inside. Get ready for another season of riding with great deals, but hurry - offers end 11/18,2018. 7 practical gift ideas for the Arctic Cat snowmobiler you're buying for (men, women, & kids)! Babbitt's Has The Lowest Price Guarantee For 2016 Snow Check Offers! 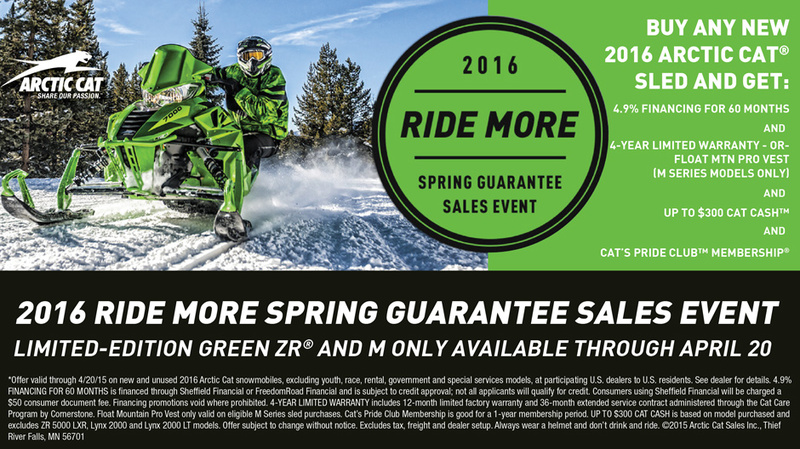 Pre-Order Your NEW 2016 Arctic Cat Snowmobile Today! We know the trails are still fresh and your are probably still out riding, but that does not stop Arctic Cat from releasing their new 2016 line-up to tease you for next season! New models are limited, so stop into today with your deposit to claim your new sled and take advantage of these great offers. Act fast, these deals are only good through April 20th, 2015.